Before helicopters were involved in upland footpath work, the stone used for building paths was sourced on and around the work site by hand. This often restricted the size and shape of stone available to pitch with and made the job far more time consuming. This resulted in long period of work on one path project. 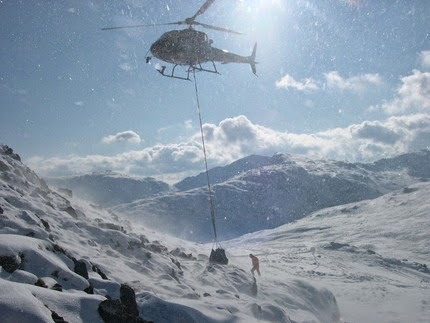 Since then helicopters have played a crucial and expensive role in upland footpath work. The advantages being, stone specific to drains, pitching and landscaping can be chosen to fill the bags. The photo shows a pitched path using stone with a flat surface for stepping on and a drain at the very bottom of the picture with longer deeper stone. 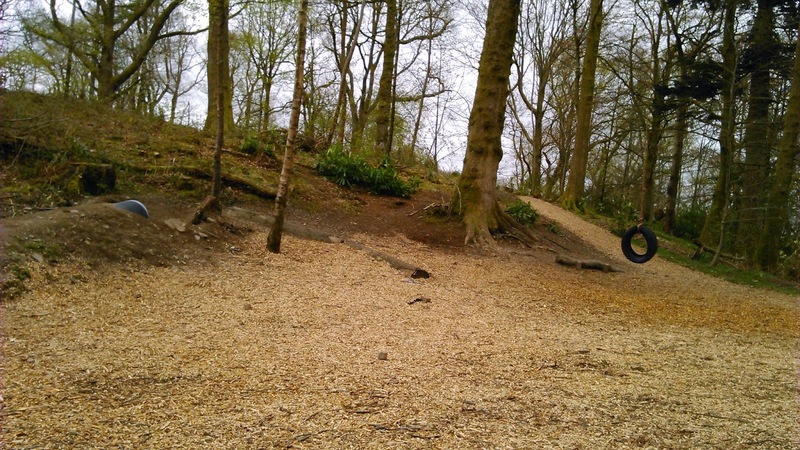 The mounds at sides of the paths have been landscaped with irregular stone to deter people from straying off the path. Stone for the bags is collected from stone sites, generally boulder fields below a crag relatively close to the work site. From here the helicopters can ferry the bags across to the work site and place them where needed by someone guiding below. This snowy Heli lift in January of 2002 was to the bad step on Crinkle Crags and Pike o Blisco in the Langdales. 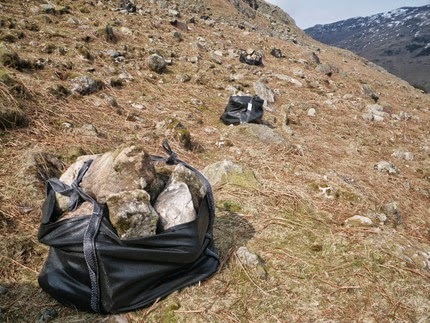 On Pike o Blisco the bags were flown to an area of heavy peat erosion between the two peaks of Pike o Blisco. The erosion had been caused by people who were undecided which of the two peaks was the summit. Those that were present when the bags were being dropped off, recall the snow being blown by the helicopter’s down draught felling like sand paper rubbing on their face. 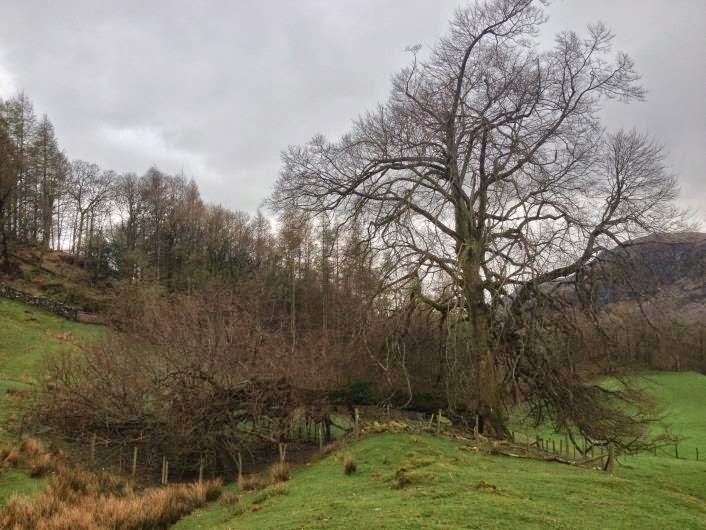 Due the popularity of the path to Wansfell, with easy access from the tourist hub of Ambleside and great view for a relatively short walk, it receives a lot of footfall. This use gives the path little time to recover and together with path steepness and rainfall the path quickly eroded. 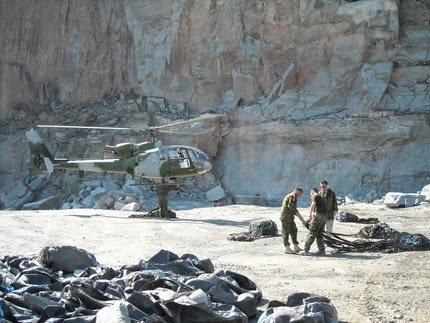 The Army in June 2008, as part of their training used three to four helicopters to lift stone for free from Kirkstone Quarry to Wansfell for work on the path. PDG helicopters based in Scotland are now the company we use to fly the bags. 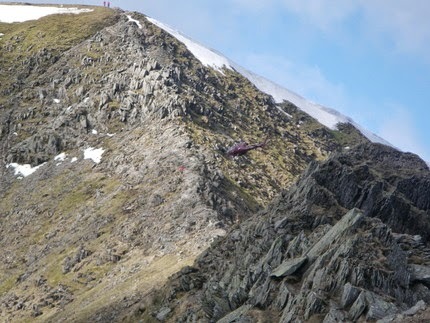 Last year they dropped bags of landscaping stone on Swirral edge, a sharp arête that leads off Helvellyn. The aim of the work carried out on Swirral edge was to protect a SSSI (Site of Special Scientific Interest) a montane habitat supporting artic alpine plant species. To prevent further damage to the habitat several granny paths that had appeared below the arête and through the SSSI were to be landscaped out; a combination of digging, positioning rocks, turfing and re-seeding to make the landscape look as natural as possible as if the path had not been there. This year similar work to Swirral edge will be carried out on Striding edge, a longer arete that takes you up to Helvellyn. 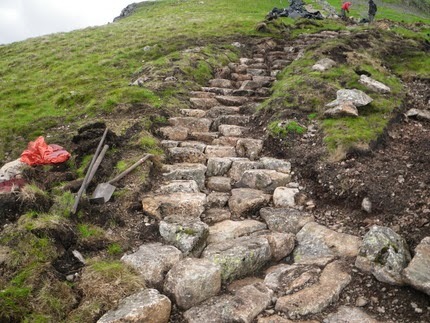 Here is a video link http://youtu.be/mIotAmED2R4 of stone being flown to our main footpath project this year, between Red tarn and Crinkle crags in the Langdales. Easter is upon us, so soon! The mild winter has passed quickly bringing with it fair weather, some lovely sunny days and a few well earned days off for many. 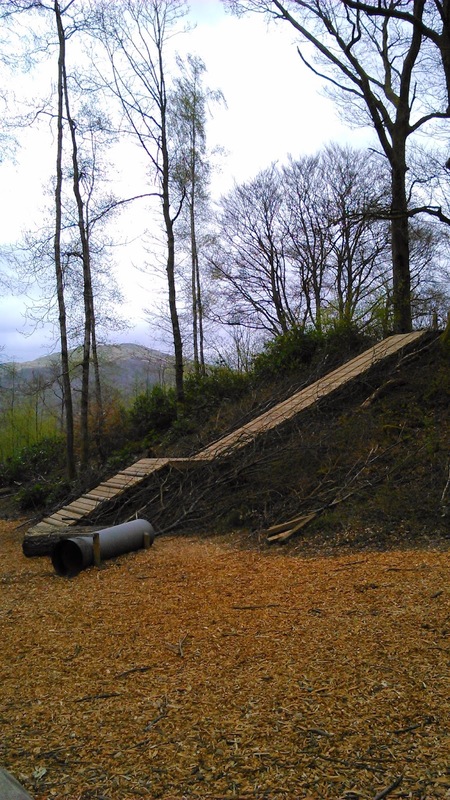 National Trust rangers have been busy over the winter months working on an extension to the play trail to entertain the young and old at Wray Castle. 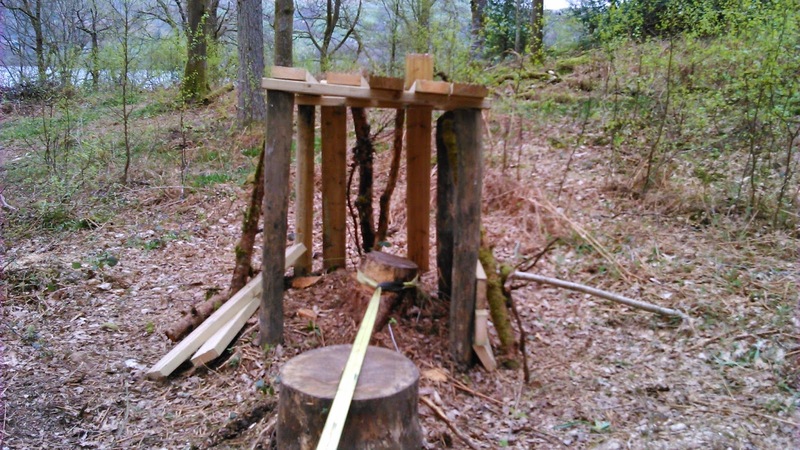 See the previous blog entry when construction first started on the trail [A new play trail for Wray Castle]. New features added include a monstrous scramble board. Be sure to visit in a few months time when those timbers aren’t so new and grippy! There are two ropes to help you up the scramble board... race you! Follow the trail through the living birch arches, balance on the fallen cherry tree, navigate your way over the stepping stones, hide away in the big den, or better still build your own even better den in the freshly woodchipped ‘den building’ area. Lots of space for new dens in here! Here, rangers are constructing a slackline with platforms at either end. Have you mastered the slackline yet? It just goes to show though that play items need not be fixed down. 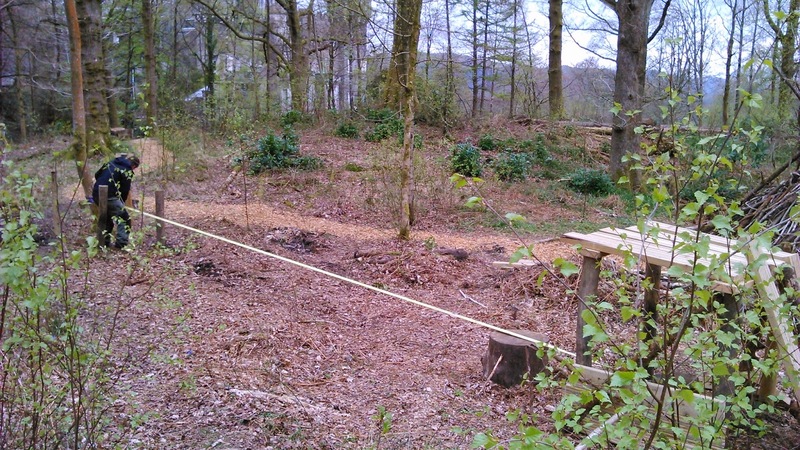 Timber set aside for the slackline platforms had been used for play by some creative play trail users! There are lots of other Easter themed activities going on at the castle too this weekend. Check out the Cadburys Easter Egg trail where proceeds to go to charitable causes and you get a yummy chocolate egg as a prize. The forecast is looking great. So why not give the castle a visit this weekend? It will be perfect weather to get out cycling. Did you know you can get there completely off-road from Ambleside and from the Windermere car ferry. Why not leave the car at Bowness and get the ferry over to the west shore of Windermere. Bring your bike (or hire one) and cycle away from the traffic along the lake shore. If you have a mountain bike, you could take an OS map and head up onto Claife Heights as well to make a day of it. You can get fantastic views up and down the length of Windermere. Look out for Claife Station opening up in the next few months to recreate those Victorian views. Don’t have a bike? Take a leisurely stroll. It only takes about an hour to walk to the castle from the car ferry or get a boat directly to the castle from Ambleside. Or why not cycle from Ambleside, it is off-road most of the way and takes you through some delightful countryside with views over to the Langdale Pikes and the Coniston fells on a clear day. There is also a very good bus service running from Hawkshead and Ambleside. Check out the Go Lakes website for more information on all the different sustainable transport options. Please avoid bringing your car; the castle car park gets very full quickly. Enjoy eating those chocolate eggs and spend some time burning off those calories by making your way to Wray Castle under your own steam (and have fun on the new play trail when you get there!). Have a Happy Easter and make the most of the beautiful Spring weather! With winter now in full retreat (we hope), we’re coming back to full volunteering life at High Wray volunteer centre. The back end of winter was spent hedgelaying on a big hedge near Coniston, helped by all manner of groups including the Fix the Fells lengthsmen and a National Trust working holiday. It’s a classic countryside task and typical of the sort of work we do here, but not by any means the only sort of thing we do. We recently spent a very different day with TTP (Trust the Process), one of the large drug and alcohol rehabilitation centres we work with, at the National Trust’s campsite at Low Wray. Using large logs, loads of gravel and the enthusiasm and hard work of this group we were building platforms outside four of the camping pods there. It’s quite muddy in places near the pods, so these ‘patios’ will not only give campers extra room to sit out but will also reduce the amount of mud being trod into the pods on shoes. The combination of being out in the fresh air, working together as a team and doing some constructive work that’ll increase people’s enjoyment of this beautiful place was a big hit with the group even if most of the mud did end up all over them! More mud than volunteer - the results of a hard day's work ...! It’s this variety of task and volunteer group that is one of the best things about our job. The contrast between different volunteers’ knowledge and experience was highlighted when a member of TTP who’d never left the city before asked what the white stuff was on the mountains. We’d had a fresh snowfall (since the path team’s last entry) – he’d been told it was snow by the other group members, but thought they were winding him up. When we confirmed it was he was amazed – even when winter has gone everywhere else it can still hang on up on the hills …. Two hundred years ago, the now-peaceful woods of Coniston and Langdale would have been alive with the noise and chatter of men at work and their families, coppicing trees to produce fuel for iron smelting, raw material for charcoal burning, bark for tanning leather, and a myriad of other products for which we now rely on plastic and metal, from buttons to barrels. Woodland management was a precise science to those woodsmen; the ‘semi-naturalancient woodland’ we enjoy today is the direct result of their work, as they encouraged the species with the most value – like oak and alder – and ‘grubbed out’ the trees that didn’t have a use. Truly natural woodland would have a different mix of species, and by looking for some of these species that would have occurred naturally but have been almost wiped out, we can experience some fragments of real wilderness in the midst of Britain’s man-made landscape. 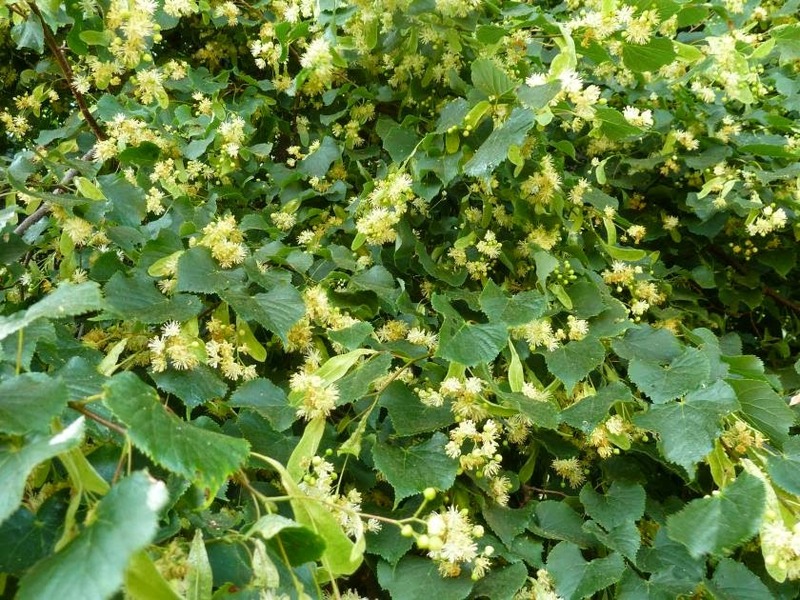 For me, the most remarkable of these ‘lost’ species is small leaved lime. Lime is an easy tree to love. Folklore considers it a feminine tree, and with its graceful, slender shape and down-curved branches creating a leafy cascade in summer, that’s hard to argue with. Woodpeckers adorn the smooth bark with orderly rows of diamond scars as they search for moisture or insects (no-one really knows). The leaves are exquisite, irregular heart shapes the size of your palm at their very biggest, and create a mottled shade that lets the sun glitter-ball through the canopy. At the height of summer, trees in full sun are covered with pale lemon flowers that exude the most intoxicating smell of the woodland year, beautiful but incredibly subtle so that it leaves you chasing after each gentle hit. 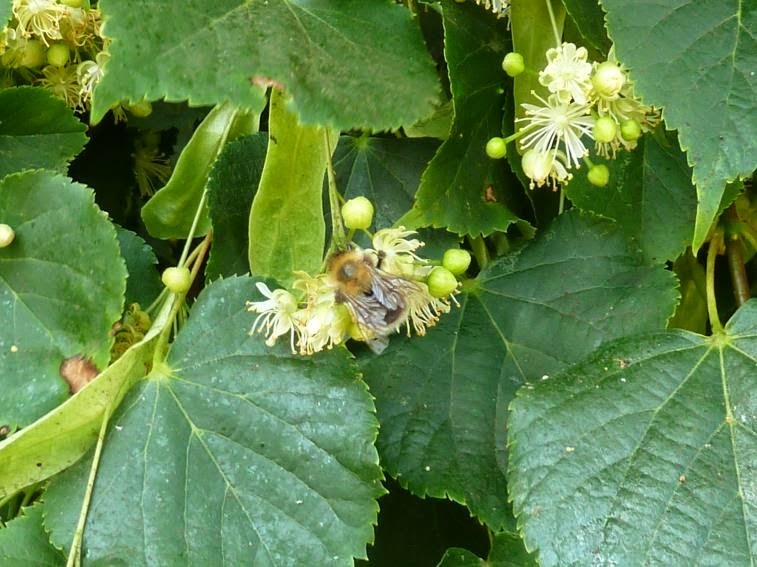 You can hear a good, sunny tree from quarter of a mile off thanks to all the bees swarming the flowers. Coniston’s relic limes are particularly characterful as they ‘walk’ down the becks, drooping over water falls and casting their gentle shade over tranquil pools. Beehives placed in limewoods were reputed to produce the tastiest honey as well as the cleanest-burning beeswax for candles – elsewhere in the country, lots of limewoods that have survived are right next to abbeys, for these reasons. But if you’ve ever tried to use lime in the wood burner to heat your house (I have), you’ll know it makes appalling firewood, and it’s not strong enough to use as structural timber or for tools. The discovery of other sources of rope as Europeans explored the globe, like jute and hemp, was the death knell for lime in British woods, and it was grubbed out all over the place. There are some hidden spots around Coniston, however, where you can still find remnant lime trees amongst the managed ancient woodlands. They’re usually tucked away up inaccessible ghylls (steep valleys with becks in the bottom), where their survival is due to the fact that it was too much work to make it worthwhile to grow and harvest other species of tree there. Sometimes, these trees still display the classic coppice form, with a number of stems sprouting from the same ‘stool ‘ showing that they have been managed as a crop at some point. Others are ‘walking trees’, demonstrating one of lime’s most fascinating ecological characteristics; where low branches bow down and touch the ground, they’ll often set roots and create a whole new tree or even an entire thicket. As the original tree grows old and dies, the younger, genetically identical parts take over next to it, meaning that in genetic terms, ‘walking’ lime trees are probably some of the oldest living things on earth. A walking lime tree - the failed branch on the left is still attached to the parent tree, but the branches have also rooted in the field creating a whole new thicket. The rangers have fenced it off to protect the new low growth from stock. What’s even more remarkable here in the Lakes is that lime doesn’t readily reproduce by seed this far north; at the limit of its range, it’s just too cold to meet the exacting conditions of warmth that it needs. So most of the remnant trees we see have probably regenerated vegetatively - by ‘walking’ – in the same spot, time and time again since the last Ice Age. To stand under one is to experience the pre-human ‘wildwood’, as a truly wild organism quietly forges its own path despite the long history of human intervention in woodlands. With such powerful ecological history, it’s no wonder that many cultures venerate lime. To Anglo-Saxon cultures, it symbolised peace and conflict resolution, and lime trees were often used as places to meet and parley, or on boundaries. This cultural connection continues in Northern Europe today, and it seems likely that even our recent ancestors understood something about the importance of lime on boundaries that’s since been lost to us; as well as the specimens in ghylls, there are other lime trees out in the Coniston landscape, whether in woods or fields, that have been left for reasons other than utility, but that we don’t understand. A classic Coniston relic lime, wandering slowly down the ghyll. But I’m not telling you where they are – finding them is half the fun. Spring is the perfect time to get out and explore ancient woodlands, when the bracken and bramble is low but the ground is full of wildflowers. 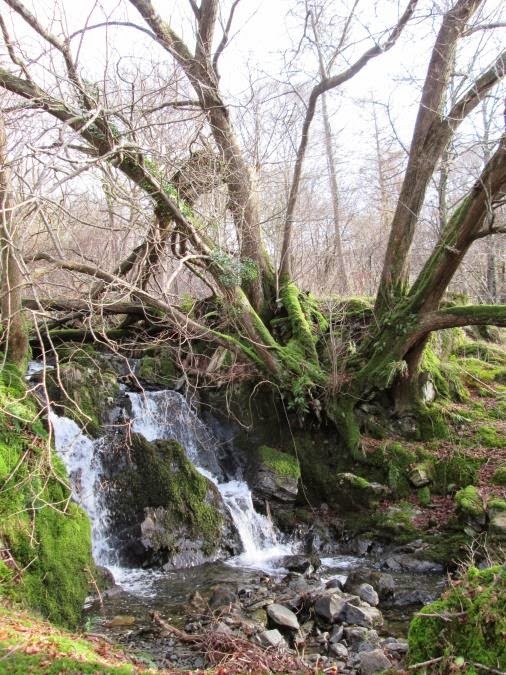 Grab a tree ID book and a map and head up some wooded becks on the east shore of Coniston. 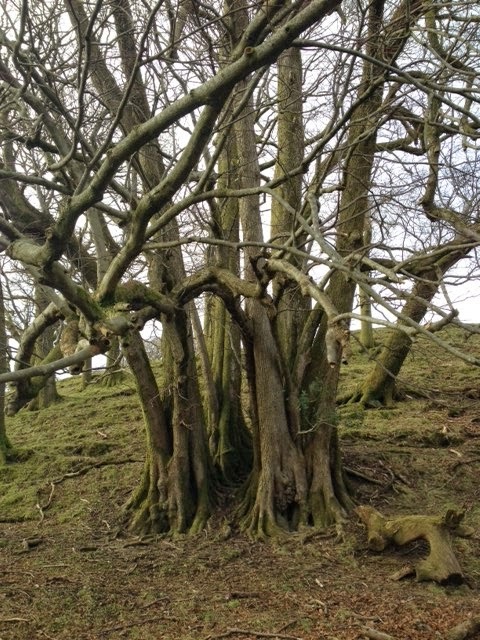 Find a lime tree and you’ll find a living remnant of the real wilderness before humans started messing about with the landscape, and a connection to the lives and lore of our ancestors – not to mention a simply beautiful, atmospheric tree. What more do you want from a day out?